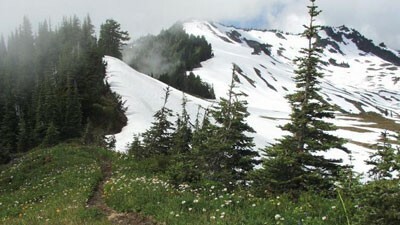 Hurricane Ridge is an easy 17 mile drive taking you up to 5,200 feet elevation. The spectacular mountains are beauty beyond words. 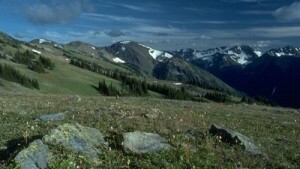 Numerous trails range from easy to very difficult, making it possible for all people to enjoy the area’s beauty. One can take a picnic lunch and spend the day at Hurricane Ridge and cap off the day by watching an awesome sunset. Driving west on Highway 101 takes you to the Sol Duc Valley road just west of Lake Crescent. The approximately 12 mile drive winds thru the valley. The Sol Duc Hot Springs Resort offers dining, a small store & gift shop and three mineral pools and a fresh H2O Pool. The Hoh Rain Forest is a not-to-be-missed attraction here on the Olympic Peninsula. Moist ocean air from the Pacific brings over 150″ (record of 211″) of annual rainfall to this area, which, along with presence of Sitka spruce and “colonnades” (row of trees that grew atop downed trees called “nurse logs”), qualify the west-facing valleys of the Olympics as the only temperate rain forests in the northern hemisphere! Three loop trails near the Hoh Visitor Center are easy to stroll and give a great sampling of the area: The Hall of Mosses Trail is 3/4 mile and shows the moss-draped maples, magically green in the spring, spectacular with color in the fall and a treat any time of year; the 1 1/4 mile Spruce Trail follows the Hoh River along red alder and maple “bottom”, and shows the landscape carved by this glacier-fed river; and a paved 1/4 mile path suitable for a wheelchair or stroller. The year- round Visitor Center is the starting point for many longer and more challenging hikes up to the alpine meadows and glaciers. 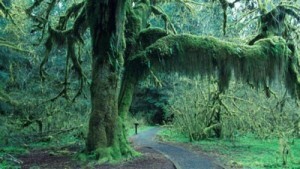 The Hoh Rain Forest is located 90 miles west of Port Angeles taking Highway 101 thru the town of Forks. Rialto Beach, north of the Quillayute River, is one of the few drive-to beaches in the area and a beautiful spot to enjoy the surf and watch shorebirds, eagles and seals. On the south side of the river, at La Push, First Beach is a mile-long crescent known for surfing-size waves and great whale watching. Second Beach, just east of La Push, is popular with photographers and is reached by way of a .6 mile forested trail that leads to a 2 mile long sandy stretch of beach with sea stacks and tidal pools – watch for the eagle nest above the tree line. Third beach, a mile east of Second beach, is a mostly-level 1.5 mile trail through natural second growth forest, a result of winds up to 170 mph in January 1921. Head to the most Northwestern tip of the lower 48, visiting Cape Flattery on the Makah Reservation located 75 miles NW of PA on Hwy 112. 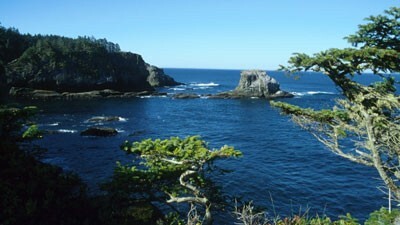 Cape Flattery is located approx 7 miles from Neah Bay. Be sure to take time to explore the internationally known Makah Museum. The museum is open every day during the summer months and closed Mondays and Tuesdays from Sept. 16 through May 31. Hours are 10AM-5PM. The Makah Museum is the nation’s sole repository for archaeological discoveries at the Makah Coastal village of Ozette. The centuries old village was located 15 miles south of present day Neah Bay. Lake Ozette is located off of Hwy 112 on the Hoko-Ozette Road and follow the road 21 miles to the Ozette Ranger Station. Three miles of planked trail lead the hiker to Sand Point, one of the most beautiful and primitive beaches on the coast. Continuing north along the beach you will find dozens of Indian petroglyphs at Wedding Rocks, ask for the interpretive handout at the ranger station. 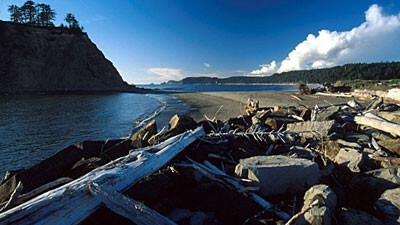 The northern point of this 9 mile triangular trail is Cape Alava, with a rocky shore and reefs to explore at low tide. Enjoy the sparkling lights of Victoria by night from Port Angeles and by day take a ferry over to Victoria and enjoy the friendly, flowered English city. The 18 mile crossing time is 1 1/2 hours. Phone 360-457-4491. 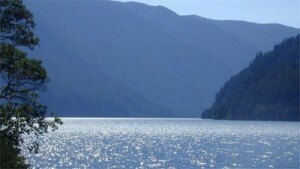 The M.V.Coho Ferry operates all year except for 2 weeks in January. A vehicle is not necessary for a day trip. There are numerous tours available as well as excellent public transportation. While in Victoria, you’ll have a vast array of activities to choose from including the world famous Butchart Gardens founded in 1904. From the exquisite Sunken Garden (once a limestone quarry) to the charming Rose, Japanese and Stalion gardens, this 50 acre showplace still maintains the gracious traditions of the past. The Royal B.C. museum is located in the Inner Harbour area. The well designed museum offers something for everyone. Also located in the Inner Harbor is the grand old Empress Hotel; be sure to browse thru the many intriguing shops and perhaps linger awhile and enjoy High Tea. Another interesting part of Victoria’s history is the Craigdarroch Castle built in the late 1800’s by Robert Dunsmuir, a Scottish immigrant who made his fortune from Vancouver Island coal. 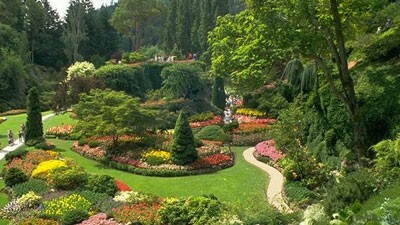 Remember; Victoria is located in a foreign country and picture ID is required to enter and leave Canada. U.S. Customs phone # is 360-457-0330. Park fee: A pass is required to enter the Olympic National Park. It can be attained at any of the Park entrances. No pass is required during the winter months for the Elwha Valley or the Sol Duc Valley. 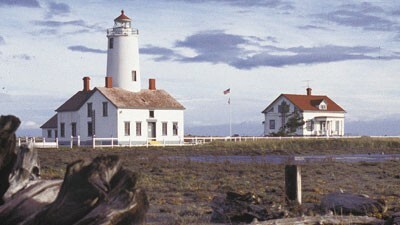 Phone # for Olympic National Park Visitors Center in Port Angeles is 360-452-2713. Salt creek County Park located on the Strait of Juan de Fuca west of Port Angeles offers fascinating tidal pools, (ask your hosts regarding tide tables). Port Townsend, known as "Washington's Victorian Seaport" is less than an hour east of Sequim. Victorian homes and commercial buildings erected during the late 1800s are still the city's trademark, along with Fort Worden State Park.